Ross Jenkins, Art Mueller, and Morris Abrams are not your average high-school students. While other kids are cruising around in their cars or playing ball, this trio, known as the Galileo Club, is experimenting with rocket fuels. Art's uncle, the nuclear physicist Dr. Donald Cargraves, offers them the opportunity of a lifetime: to construct and crew a rocket that will take them to the moon. But there are those who don't share their dream and who will stop at nothing to keep their rocket grounded. North Power Air is in trouble. Their aircraft are crashing at an alarming rate and no one can figure out the cause. Desperate for an answer, they turn to Waldo, a crippled misanthropic genius who lives in a home in orbit around Earth, where the absence of gravity means that his feeble muscle strength does not confine him helplessly in a wheelchair. But Waldo has little reason to want to help the rest of humanity - until he learns that the solution to Earth’s problems also holds the key to his own. 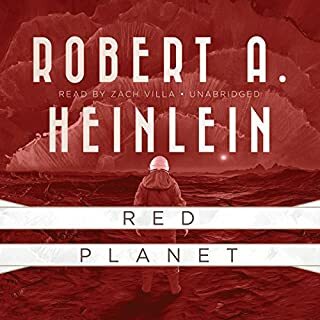 ©1955 Robert A. Heinlein (P)2012 Brilliance Audio, Inc. I first read Farmer in the Sky about sixty years ago. 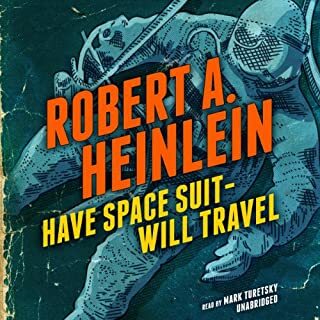 As I listened to it just now, I realized how much this book, originally published in 1950, and others like it, were instrumental in sparking my lifelong interest in science and space travel. 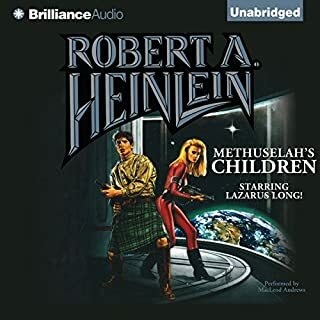 Robert Heinlein, along with others with names like Asimov, Clarke, Bradbury and Sturgeon was among the writers from the so called "Golden Age." of Science Fiction. Although much of the science in this book is now dated and obsolete, a lot of it was amazingly prescient. It is about a teenaged boy whose family left Earth to join a colony on Ganymede, one of the moons of Jupiter. Farmer in the Sky was written for young people over a decade before Alan Shepherd was the first American to "blast off" to the edge of outer space. I have little doubt that many of the scientists and engineers who made that possible were inspired by books like this one. Classic scifi at its best! Likely most would skip this based on the title and miss a great story. Classic scifi with a twist! What did you love best about Farmer in the Sky? Good story, and great performance! If you could sum up Farmer in the Sky in three words, what would they be? It's a typical Heinlein Juvenille work. What other book might you compare Farmer in the Sky to and why? Nick is a master of accents and voices. At one point, I was asking myself---is that the same guy? WOMEN HAVE THIER UPS AND DOWNS, YOU'LL GET USE TO IT. Written in 1950, besides being dated it is a little politically incorrect. NO SORE HEADS, NO WEAK SISTERS. Wish we could get that through the head of those today, that always think a theory is the same as proven fact. This is an adventure story into space. Imagine living on Ganymede and having most of the sky filled with Jupiter. 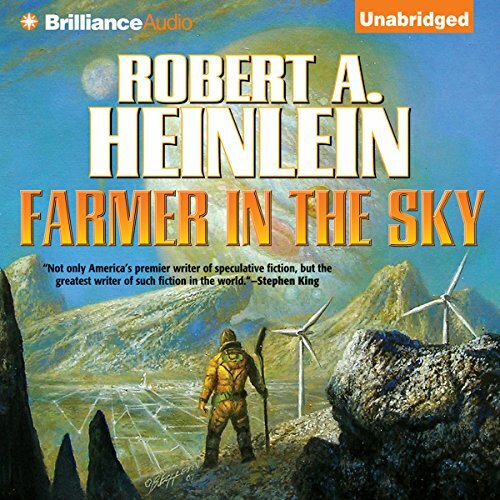 Heinlein explains what the sky looks like, how they gave the planet an atmosphere and how to make the soil fertile. It might have a little too many science facts for some, but I can see how it would get young people excited enough to study science. this is RAH at his best. It's before he went money hungry and weird. It's a great book for all ages. The concept of terraforming and colonizing our solar system. I read this book when I was in my teens - a looong time ago in other words. In my heart I always hoped that these opportunities would be available in my lifetime. How sad that we have the runaway population growth and the hunger that goes along with it, but not the ability to expand our living space - into space. This was written quite a while ago and in some respects has not aged well. But it was written for a Scouting magazine in the vernacular of the time. The concept is more timely than ever. 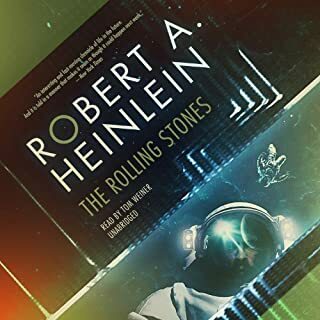 If Heinlein were writing it now I'm sure he would revise some of the technical details but human nature hasn't changed and the motivations of the characters to be pioneers would be much the same, I think. Not a thing. He sounds just like Bill should. I first read this and many other Heinlein books in high school, where I learned to love science fiction and come to realize that I was born hundreds of years too early (& later also learned from Heinlein - Stranger In A Strange Land), that I would have my chances for living in the future as time and my Soul’s life times allowed me to teach and be taught as I progressed through my many life times. If you want to know the plot of this book, find it easily almost anywhere. 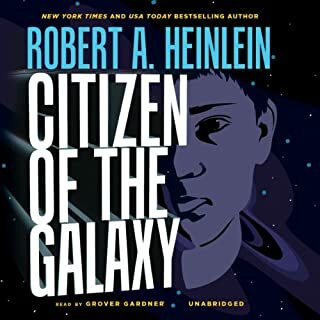 Just know that this book is excellent in many ways, the main character and storyline is ideal for an adolescent boy (no matter what his age) and that Audible provides the best manner of telling the story, with the best narration. 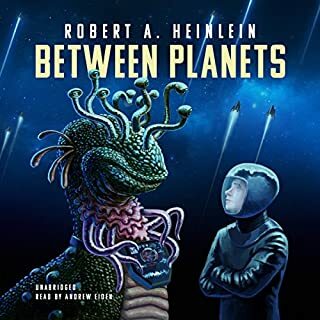 This Audible Book served as a most enjoyable review of one of my first and most favorite SF books. Buy it and give it a listen, you won’t regret it and it’s well worth the price! For a young audience but enjoyed by this 29 year old :) This is a must listen.